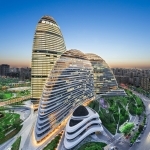 来自 易兰规划设计院 对gooood的分享。更多关于：ECOLAND on gooood. 点此查看望京SOHO项目，click here to see the Wangjing SOHO project on gooood. 更多关于望京Soho的用户的使用体验，请点击下面的链接观看详细内容：everyone | gooood x Wangjing Soho. We interviewed people who works at SOHO or lives near by. please click on the following link to see more: everyone | gooood x Wangjing Soho. 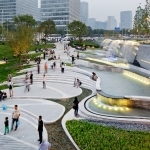 The Wangjing SOHO project’s organic park structures, fountain plaza and botanic pathways provide a well designed, healthconscious environment in the midst of an urban retail property. 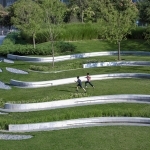 The open exercise spaces merge seamlessly with the building’s aesthetics, providing a community hub for local workers and residents in the booming Wangjing zone. 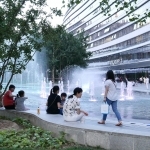 Wangjing SOHO has become one of the city’s most notable high-rise landmarks, and its gardens, a nucleus for the local neighborhood. The project result is a restorative and refreshing oasis for residents in the densely populated and urbanized district. 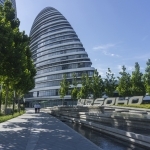 Wangjing SOHO, with its rounded architecture and eco-friendly landscaping, has become a new sub-center of the city. The project goal was to createhealth conscious community space in three distinct garden areas (northern, eastern, and southern blocks) surrounding the buildings. 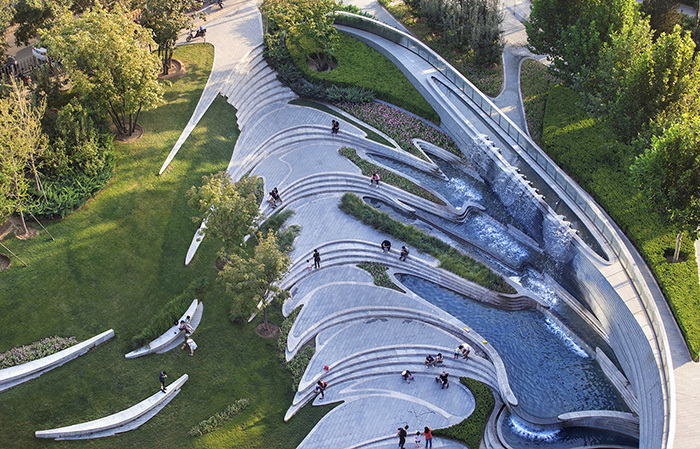 Its flowing lines are integrated into every element of the project’s design, from the bridge to the fountain.Subtle details in the plaza’s contrasting stone paving bring attention to transitions within the site, guiding walkers and runners from one area to the next. 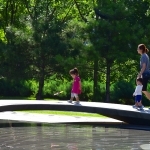 The pathways provide safe and pleasant thoroughfares for people entering through the neighboring developments, providing a simple and cost-free way for visitors to enjoy the health benefits of the park’s design. 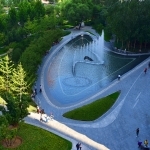 While all aspects of the park are remarkable, the northern park has a foremost impact on the community and serves as a central gathering space with its musical fountain, the Wangjing Eye.Choreographed water jets delight the diverse crowds seeking peaceful rest and meditative enjoyment. The fountain mechanisms are hidden, allowing safe transformation from fountain pool to grand plaza when required, to accommodate larger crowds. The tranquil fountain’s locationkeeps it shaded in the hot summer months. 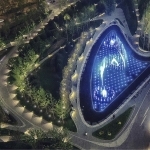 The pool is traversed at its eastern end by a unique, patented design bridge, which curves both horizontally and vertically, allowing for gentle walking. Tree plantings soften the roar of the nearby streets. 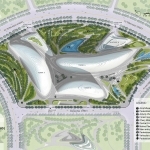 Special consideration was given to the birds-eye view of the northern park as it can be viewed from offices above. 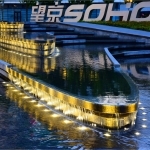 Custom lighting is built into seating, floors and fountains, so that no light source is seen directly, aiding in the unique identity SOHO desired. 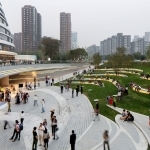 While each individual space has its own unique function and personality, together they create a cohesive, healthy green landscape for the community to enjoy. 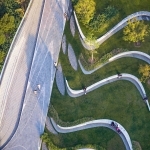 The walking pathways in the western park are carefully planted with native species, which filter rainwater, absorb air pollutants, and assist in mitigating the urban heat island effect in summer, allowing for maximum benefit from the maximum number of visitors. Eco-friendly native species require fewer resources and management whilst providing a dynamically colorful view. Thevibrant plant palette in the heavily urbanized Wangjing district also provides essentialwildlife habitat including beautiful butterflies. Lush plantings along the East Park sub level amphitheater, including tall trees and water features, successfully reduce noise pollution from outside the park, and provide cooler space during summer months, drawing patrons all-year-round. 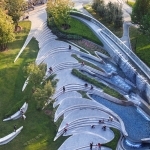 The space is multi-functional, hosting socializing space, yoga classes and performances, while assisting in storm water management, as pervious areas filled with decorative pebbles and plantings filter the site’s run-off water and directs it towards catch basins and beyond to the municipal storm system. 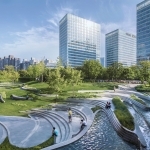 The project sets a new standard in China with itshealth-focused design features, responding to the need for a city’s backyard living room oasis where people can interact each other and with nature, while improving their health.